Los Alamos, New Mexico, April 18, 2018–Explosives have an inherent problem – they should be perfectly safe for handling and storage but detonate reliably on demand. Using computer modeling and a novel molecule design technique, scientists at Los Alamos National Laboratory have replaced one "arm" of an explosive molecule to help unravel the first steps in the detonation process and better understand its sensitivity — how easily it begins a violent reaction. "It started out with, can we take a common initiating explosive PentaErythritol TetraNitrate (PETN) and replace parts of it to change sensitivity properties," said explosives chemist Virginia Manner. "So we replaced an arm of PETN with various non-energetic groups to see how those different groups could change the sensitivity of the overall molecule. This is the first time we've taken a fundamental system like this and changed different parts of it to see how it could affect sensitivity." The research was published today in Chemical Science the "flagship journal" for the Royal Society of Chemistry. The researchers were able to change the sensitivity of the PETN-type materials, making them both less sensitive and more sensitive. PETN was invented in Germany in 1894, is one of the more powerful explosive materials, and is typically used only in small quantities due to its relatively high sensitivity. Another novel approach to this research is the close collaboration between chemists and computer modelers at Los Alamos. "About three years ago I realized that some modeling would really help," said Manner. "So I asked Marc Cawkwell to work with me and realized we had totally different ideas on what made explosives sensitive. I thought it was all just fundamental chemistry and he thought it's the mechanical properties that are controlling whether an explosive is insensitive or sensitive. Over the course of this work we slowly convinced each other that we were both wrong!" "Or rather, partly right!" added Cawkwell. Using a molecular dynamics computer code written at Los Alamos called "LATTE" Cawkwell is able to model the making and breaking of chemical bonds in explosives very accurately. "The chemistry comes from the electronic structure of a molecule," said Cawkwell. "With LATTE we can accurately calculate the energy of a molecule and the force on every atom from its electronic structure, which allows us to propagate the positions of all of the atoms forward in time and let the system evolve. If the temperature and pressure are high enough then we see a cascade of chemistry that initiates an explosion." The modeling is then used to interpret experiments in the form of a drop-weight impact test, to see if a newly synthesized explosive initiates easily (sensitive) or requires more force (insensitive) to explode. What the modeling provides is a much deeper understanding of the underlying processes in a detonation. "It really allowed us to understand these fairly simple drop weight experiments in exquisite atomistic detail," said Cawkwell. "For instance, the 'unzippering' reaction in PETN that was identified by our colleague Ed Kober from the LATTE simulations was something neither of us could anticipate." "The ultimate goal is to see if can we predictively tune explosives,"said Manner. 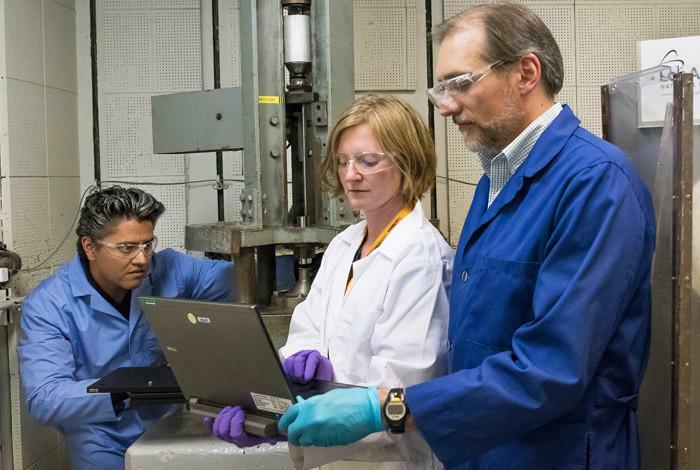 "In the future people are going to want to know, how can we make explosives more or less safe or sensitive, particularly for nuclear stockpile applications. In general, people are just looking at these explosives that have been around for 100 years or more and trying to understand them. So we thought if we can make a system where we're systematically tuning sensitivity, where we really understand the molecular properties that are affecting initiation the most, then we could guide the development of new explosives in the future." The Chemical Science research article can be found here.Cawkwell and Manner acknowledge the extensive contributions of the paper's additional authors, Edward Kober, Thomas Myers, Geoff Brown, Hongzhao Tian, Christopher Snyder, Romain Perriot and Daniel Preston, without which the work could not have been completed. The research was funded by Los Alamos National Laboratory Science Campaign Two.